"If you are looking for pet gifts this Holiday Season, you cannot go wrong at Royal Pets! Our kitties will be in their glory on Christmas morning!" "My poodle Chico was groomed by Audrey today- fabulous! he looks so great and came out so happy!" "Thanks so much for the spa treatment, I really needed it! And thanks for letting my rescue team, Rugaz Rescue Inc., come out and promote its Adoptabulls – everyone had a great time! See ya soon!" "Royal Pets Market & Resort is the BEST!!! My King Bear absolutely loves it here. The employes are awesome and so friendly. I am so glad that we found them." "I was delighted to learn of Royal Pets Market & Resort. Just one visit was enough to convince me that I had last found somewhere where I could safely leave my dogs. We found the kennels very homely and were met by the lovely kind staff who obviously adores dogs. Finnley, our Goldendoodle, regularly attends Doggie Day Care several times a week. It’s great knowing that dogs can come to you and be safe, have fun and stimulate exercise, and clearly be cared for as if they were the staff’s own pets. We have also used their boarding services. We could not have chose a better “holiday home” for them! The boarding facility is spotless as the rest of the resort. We also use the grooming center and they love being pampered. I highly recommend you pop in for a visit to take a tour and see first-hand the many services they have to offer your dog or cat. 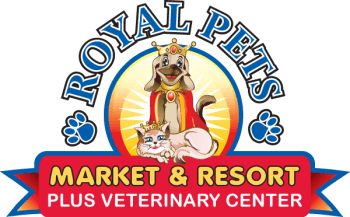 We use Royal Pet Market & Resort for all our pet’s needs. Everything from grooming, nutrition, and education. It’s truly a unique place! I know thy take great care in the individual needs of each dog, and that level of service is rare these days." "The day Royal Pets Market & Resort opened was a blessing in my life. I had tried other daycare places before Royal Pets Market & Resort opened and none of them could hold a candle to the stellar service I receive here! Every employee goes over and beyond in customer satisfaction.I give Royal Pets a five star recommendation. You will be happy you came, but your pet will be even happier."